If you are thinking of getting admission in fall 2014 the clock is ticking and August is drawing to a close. 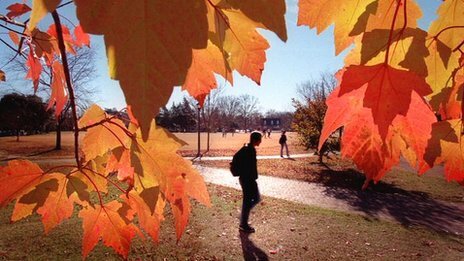 So, if you want to be in your American university at around this time next year, what should be your priorities in the next couple of months (and as you can see from the picture above, it really is beautiful there during fall). Hint: one thing that you will need to do is start thinking about which universities to apply to – and then there is going to be a lot of head scratching that you will have to do to select universities to apply to …and so much interviewing and researching that you are going to feel .like a news reporter! The details are below. Ready to read? Well, get set and go! Indian students applying to a foreign university have to take exams to certify that they have the required basic minimum skills in English. The Test of English as a Foreign Language (TOEFL) and the International English Language Testing System (IELTS) are the two leading tests for this purpose. This post gives you links to some of the most important information about these two tests of English proficiency published earlier on this blog. Take a look. You may find answers to questions you have been waiting to ask.